It's now officially March which means that all birthday related posts are allowed, right? It's less than two weeks till my birthday now (23rd March), but every March I become extremely excited with a reason to celebrate for as long as I can (which trust me I manage…my 18th was a week long celebration)!! A few weeks ago I was asked to come up with some ideas, mainly from my parents and boyfriend and I'm sure they'll regret it now the list is almost 2 pages long, but if that's what they wanted. I mean most of my list is now thanks to the girls I speak to on twitter and my many hours I spend on the internet…my list has now become so long I feel I may need to write more than one post. 21st is a special milestone birthday isn't it and I'm a poor student which mean I'm obviously adding the pricey things to my list. This includes high end makeup which I've not been able to afford before, (all those will be in another post soon). I'm hoping for the obviously tacky '21' gifts…which honestly guys I really want!?! Shamefully I want the keys, champagne glasses and photo frames. So for this birthday I really hope I'm treated to lots of these things, oh pretty please!! Being a shorty means I'm obsessed with heels, I may not wear them 24/7 but I love them all the same. Both pairs on my list are two I've been lusting over for a while. I've wanted a pair of t-bar heels for some time now, as these would be great to wear them with almost any outfit, especially with summer approaching they'd be perfect. The other pair is more for the brand rather than these particular shoes, but I do love these. A subtle design with 3 cute floral pattern on the heel. Since I was about 16 I've adored 'irregular choice' so this birthday seems the appropriate to add them to my list. The next big want on my list is the polaroid printer, well that or a fujifilm instax mini polaroid camera…I've yet to decide which will be best suited for me and for the money. But if you've been following me for a while you'd know that I love photos and so these would be perfect as ever since I was a kid I've wanted a polaroid camera of my own. I've been wishing for some perfumes, Wonderstruck by Taylor Swift being one of the many. I had this last year and I miss the smell so much…seriously, it's amazing! Also you see that blue bag, I was sent a link a few days ago during a twitter chat and I've completely fallen in love! I want the bag in each colour yet sadly no real excuse or need for it. I have a long list of pandora charms I'd love to add to my collection but seriously I'd been happy with just one new one. The mascara everyones been raving about recently, and sadly I've not been able to buy it so that item for my birthday would be perfect!! My last few things include Disney, the tinkerbell is a cute little figurine which include my birthstone and the mug well that's got my initial and I find both of this items adorable, who wouldn't love these products! I'm so excited for next weekend, as it means lots of celebrating and lots of alcohol hehe and I love birthdays and especially this one as it's so special, ekkk! Such a cute list! 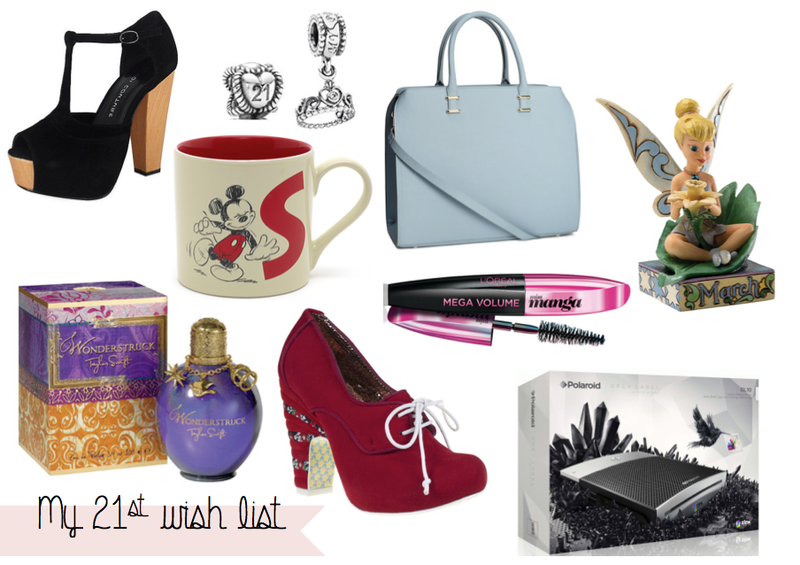 As well as all the bits your lusting after it is nice to get all the special 21st stuff like you said! I've still got all mine in a big box in the loft, it will be nice to look back on one day! Irregular choice shoes are so cool! I don't think I could ever pull them off but I always love looking at them when I go shopping! Ahhhhhhh it's that beautiful H&M bag again! Sold out online :( I'm going to go and hunt for it next week though and just hoping it'll be in stock! My sister's birthday is also 23rd :) And mine is 19th so one week today! WOOOOOOO! Had to e-mail my Mum today and question why she didn't give birth to me a week earlier, the weather has been so beautiful today, it would have been perfect birthday weather. And them shoes are incredible! Happy birthday for the 23rd! Those t-bar heels are absolutely beautiful - they look like they'd go with everything. And the denim blue bag is stunning! I can't believe it's from H&M - looks much more expensive. Fingers crossed you get spoiled on the big day - it is your 21st, after all! I wish wish wish I could find that blue H&M bag. I work there and kept putting it off and now they've all gone. Have a lovely birthday m'dear!